Recently I was asked to write an article for an internal company training newsletter about flying slow. Having finished it I thought I’d replicate it here for others. 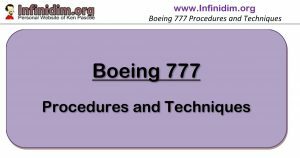 Note the following article is aimed specifically at the Boeing 777 series aircraft, although the concept is common across all transport category jet aircraft flying slow at high altitude. Comments welcome! It seems that no matter how close we are to our scheduled arrival time, ATC regularly require us to slow down as we approach top of descent. You’d think that after managing a flight of 14 hours so as to be exactly on time into Sydney, they could at least give us some credit over those who are arriving early or late. This brings about a question I’ve been asked a few times lately – how slow can we go? The Boeing FCTM is curiously absent on this question. If you want a short answer – use FMC Best Holding Speed, unless in Turbulence or near Maximum Altitude (in which case choose something faster). If you want to know some background … read on. There are several possible answers to this question. Turbulence Penetration – 250 kts; 270kts; .82M or Vls +15 knots, whichever is higher. Vls (lowest selectable speed) itself. NB : Vls is an Airbus term. On the Boeing it’s the top of the amber arc on the Airspeed tape, and is given the cumbersome name Minimum Maneuverer Speed by Boeing. It’s the lowest speed the Autopilot will choose to fly at, it’s the speed the Auto Throttle will maintain if you try and fly slower. Remember that Turbulence Penetration Speed (Vb) is just that – a speed chosen for the penetration of Severe (or more typically Moderate) turbulence. It’s not a speed designed to give a smooth ride to the passengers; it’s not a speed selected to provide the greatest compromise between low and high speed stall – instead it’s a maximum speed at which the aircraft is designed to survive a maximum gust of 50 fps/3000 fpm (yes, this is simplifying more than a bit). As such it’s not a speed designed to limit how slow you can fly the aircraft. It’s not bad choice – particularly if you are being asked to slow down in light or moderate turbulence – it’s just that if the air-mass allows and you wanted to fly slower, you could. As an aside, those of us who were on the aircraft in the early days will remember that turbulence penetration used to be Mach .84 at altitude. You’d be cruising along, hit a bump, speed intervene and speed up. It was awesome – we encountered a lot of turbulence in those days, particularly when we were in a hurry … On the 777-300 with its higher Vmo this had no real issues but on the -200 aircraft, particularly when the turbulence experienced produced indicated airspeed instability – high speed excursions were not unusual past Mmo. Eventually Boeing brought Vb back to .82 (and then later modified it to be at least Vls +15) in order to provide a consistent speed across the range of 777 aircraft that kept us clear of Vmo on the -200 and Vls on the -300/200LR. Best Holding Speed is a good choice. It’s often closer to Vls than Vb but still provides an increased margin of available bank angle (or dynamic increase in aircraft weight) than Vls itself. 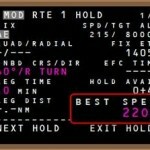 The best holding speed can be obtained by inserting a present position (PPOS) hold in the flight plan – without executing – look at the pending hold, the best holding speed is on the bottom right hand side. Remember that this speed does not account for turbulence. Also while it does account for weight and altitude and therefore will provide a margin over high and low speed stall/buffet – best holding speed is in fact chosen specifically for maximum endurance – maximum time aloft. 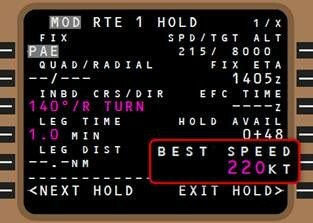 Don’t forget to erase the modification to your flight plan. While it’s not specifically a minimum speed – the FMC Best Holding Speed is usually a good compromise choice when asked to slow down by ATC. Note : Be aware (be very aware) of the predicted holding speed on the hold page. This feature tells you what speed the FMC intends holding at – along with the predicted altitude at the hold. That’s all well and good and likely to be accurate if you actually take up the hold at that altitude – but otherwise is not a valid speed for your current altitude. Meanwhile if you manually enter a target altitude here, the calculated speed will be appropriate for that altitude – and that altitude alone. This becomes particularly significant if you are comparing speeds between altitudes above and below FL200 – as one B744 crew found out. See also Low Speed Climb and FL200. By design, this is clearly the lowest speed that should be considered for flight. This speed will be less than Holding Speed, and less than Vref 30+80 when below FL200. While a valid choice at lower altitudes, it reduces your margin above events such as auto throttle wakeup, EICAS AIRSPEED LOW, stick shaker and other occurrences that are down linked expeditiously to home base. 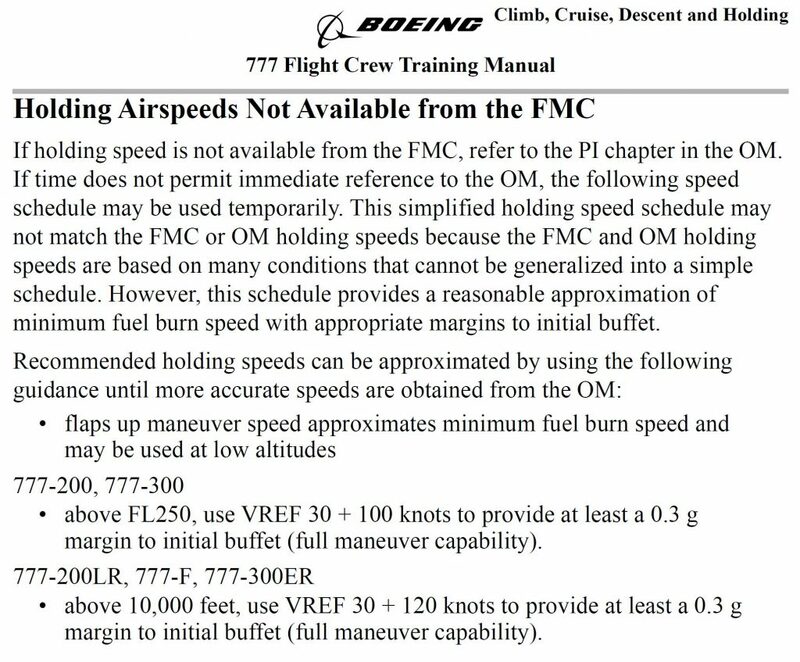 When cruising between FMC Optimum and Maximum Altitudes in the 777-200 (and especially 777-300) slowing towards Vls could well leave the aircraft without enough thrust to recover speed – a descent would be required. Excess thrust simply isn’t available in those aircraft (particularly when CRZ was the chosen thrust reference) and anything below approximately best hold speed was behind the drag curve – occasionally you required simply more thrust to recover speed than was available, and a descent shortly followed. Meanwhile the FCTM provides some quick reference guidance to a holding speed recommendation when nothing more sophisticated (FMC, FCOM) is immediately to hand. This number is quite conservative – which is probably something you want in a B777 at altitude without and FMC or and FCOM. Vref 80+120 for the B777-300ER. There are of course a myriad of speeds you can choose to fly at. It’s incumbent on the PF to select a speed that complies with ATC as much as practicable, in keeping with the safe operation of the aircraft. The speed you choose needs careful consideration anytime you’re operating in turbulence or above Optimum/near Maximum Altitude – margins are reduced and while the 777-300ER doesn’t lack thrust, in turbulence you might find yourself having difficulties recovering if you choose a speed too far behind the drag curve.